"What is CRM Software? How to Use Customer Relationship Management Software?" CRM software systems are used to manage business contacts, employees, clients, contract wins and sales leads. One important aspect of the CRM software is that they compile data from a range of different channels, including a company's website, telephone, email, live chat or most recent -social media. Through the SalesFundaa CRM approach and the systems used to facilitate it, businesses learn more about their target audiences and how to best cater to their needs. Customer relationship management is an application of technology that is fundamental aspect to devise strategies to learn more about customers' needs and behaviours in order to develop stronger relationships with them. It is more of a business philosophy added to a technical solution to assist in dealing with customers effectively and efficiently. In short this simple devise can also serve different functions for its user. Operational function of a CRM is made up of mainly marketing, sales and service automation. The main aim of a customer relationship management systems is to integrate and automate sales, marketing, and customer support. It provides an insight into client information, past sales, previous marketing efforts, and more. Summarizing all of the relationships between the customer and the firm. The analytical function of a CRM software is to analyze customer data collected through multiple sources, and present it so that business managers can make more informed decisions and base stragtegies on these decisions. The third main function of CRM software is to incorporate external agency info such as suppliers, vendors, and distributors and share customer information across organizations. As information collected from technical support calls often provide direction for marketing products and services to that particular customer for the future. A customer data platform is a computer system used by marketing departments that assembles data about individual people from various sources into one database, with which other software systems can interact. Customer relationship management is a system devised for running a successful business. The better the relationship, the easier it is to conduct business and generate revenue. Therefore using technology to improve CRM makes good business sense. The better a business can manage the relationships it has with its customers the more successful it will become. Therefore IT systems that specifically automate dealing with customers on a day-to-day basis are growing in popularity. A CRM application is a better way to manage so that you can be more organized and do more with less. An effective CRM application provides an organized, comprehensive view of a company's customers and prospects, and employees' interactions with them. 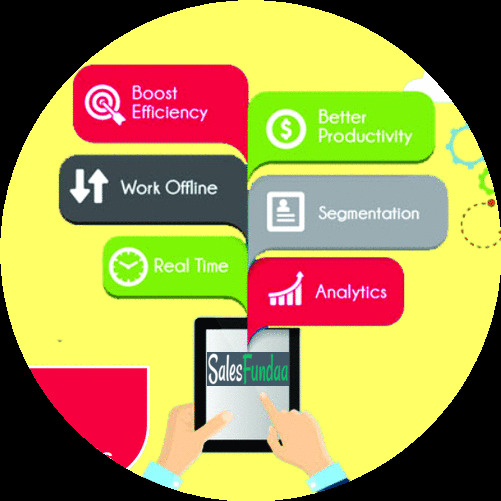 Once considered a large-business priviledge , SalesFundaa CRM software packages are now more cost effective and come with modules that can be customised to meet business processes for small and mid-size businesses. There still exist myths that implementing a customer relationship management solution might involve considerable time and expense. But its potential benefits have a leverage over the myth. Identifying specific customer requirements delivering the right product. Optimised profitability by focusing on the most potential customers and dealing with the non potential ones in a more cost effective manner . Even with years of accumulated knowledge and changing technological trends there's always room for improvement . For many businesses customer relationship management (CRM) can be a large investment. Therefore it is vital to choose your supplier carefully. Making the wrong choice could be expensive and even jeopardise your business. Before buying a CRM software , you might want to double check and consider the following points. How many businesses from your industry sector are using this CRM? The most significant recent development in CRM systems has been the move to cloud computing has Freed the user from the need to install software on every desktop, PC and mobile device. Organisations worldwide are discovering the benefits of moving data, software and services into a secure online environment. A cloud-based system doesn’t need special installation and there's no hardware to set up, keeping IT costs low and removing the headache of version control and update schedules. Generally, cloud-based CRM systems are priced on the number of users who access the system and the kinds of features you need. This can be very cost-effective and is also extremely flexible – enabling you to scale up and add more people as your business grows. Cloud based platforms such as SalesFundaa are flexible in terms of functionality because you're not paying for any features that are not useful to you. Call SalesFundaa CRM for all your software solutions on - 9235 35 35 35. You can request for free consultation and demo or leave your comments on the comment box below.